The scalable Nebraska map on this page shows the state's major roads and highways as well as its counties and cities, including Lincoln, the capital city, and Omaha, the most populous city. To display the map in full-screen mode, click or touch the full screen button. To zoom in on the Nebraska state road map, click or touch the plus (+) button; to zoom out, click or touch the minus (-) button. To scroll or pan the zoomed-in map, either (1) use the scroll bars or (2) simply swipe or drag the map in any direction. (The scrolling or panning method you use will depend on your device and browser capabilities.) At any time, you can display the entire Nebraska road map in a new window or print this page, including the visible portion of the map. Nebraska's Interstate Highways connect its major cities and facilitate travel between Nebraska and its neighboring states. I-80 traverses the state between Omaha in the east and the Wyoming border in the west. I-76 splits off I-80 in western Nebraska, routing southwest toward Denver. I-180 provides access to downtown Lincoln from I-80. I-480 passes through downtown Omaha, connecting I-80 with I-29. I-680 loops around the north and west sides of Omaha, between I-80 and the Missouri River, before crossing into Iowa. 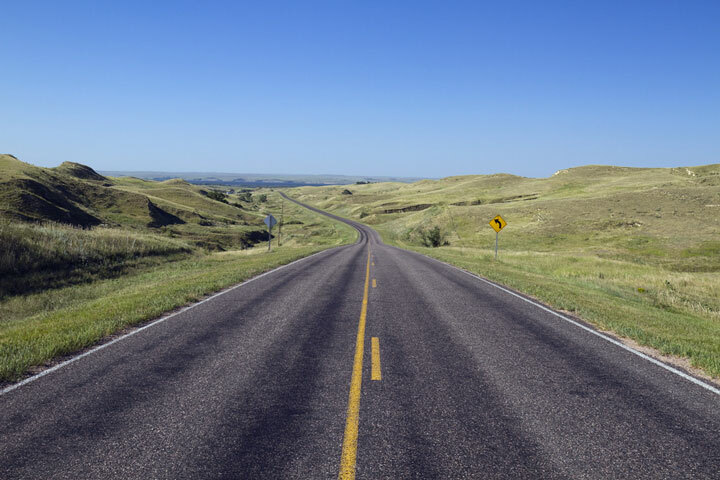 Although there are no officially-designated America's Byways in Nebraska, the state does feature several scenic routes and travel itineraries. A 470-mile drive through the Nebraska heartland on Routes 2, 83, and 20 offers the opportunity to stop at several recreational areas, state parks, and wildlife refuges. Starting at Grand Island on the banks of the Platte River, this scenic drive meanders through Broken Bow and the Nebraska National Forest. Farther east, travelers will encounter the Valentine and Fort Niobrara National Wildlife Refuges as well as Toadstool National Park, named for the peculiar sand and clay sculptures protruding from the grassland. More information about scenic roads in Nebraska is available on this Nebraska's Byways page. For more information about Nebraska's roads and transportation infrastructure, visit the Nebraska Department of Roads website. For Nebraska road traffic conditions, visit the Federal Highway Administration's Nebraska Traffic Information page. Nebraska-Map.org is a State Maps reference source.